Every vehicle owner is required to display license plates on his/her vehicle. But did you know that wasn’t always the case? New York was the first state to require vehicles bear a license plate (1901), but Massachusetts was the first state to have state-issued plates (1903). Prior to implementing state-issued plates, New York residents made their own, displaying their initials on the identifying tag. The very first state-issued plate in Massachusetts read, simply, “1,” and was issued to a gentleman named Frederick Tudor. A member of his family still holds an active registration on the tag today, 113 years later. Between September 1, 1903 (the date all Massachusetts vehicle-owners were required to have a state-issued tag) and December 31, 1903, Massachusetts issued 3,241 tags. The first state-issued tags were made of iron covered with porcelain enamel. Delaware still offers a porcelain plate and is the only state to continue to do so. The starting fee for the porcelain version is $110. Because the fragility of the porcelain plates made them impractical, manufacturers experimented with replacement materials such as cardboard, leather and even pressed soybeans. Pennsylvania was the first to issue a personalized plate in 1931. A potato was the first graphic to appear on a license plate, in 1928. It was, of course, issued in the state of Idaho. The size of the original license plates was not constant. Instead, the width of it expanded as more characters were added. Can you imagine the width of plates today if a standardized size had not been determined in 1957? Today, all but three states utilize correctional facilities to produce license plates. 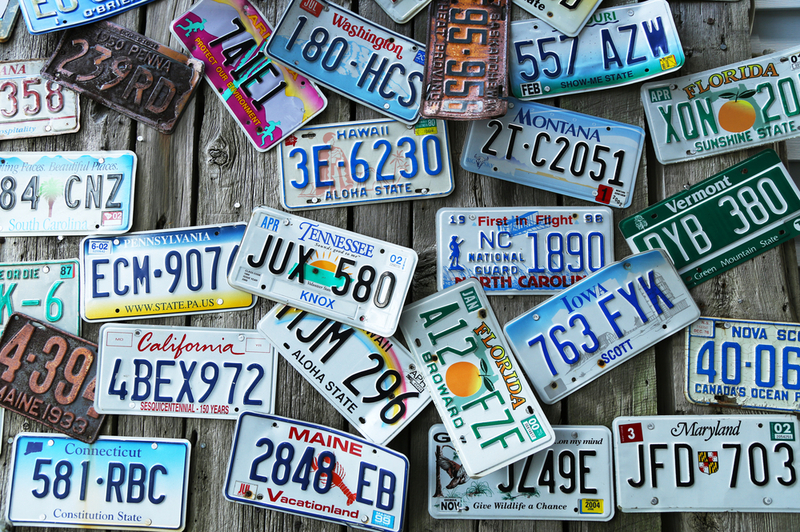 Alaska, Hawaii and Oregon utilize privately owned manufacturers to produce their state-issued tags. Vehicles owned by the United States Postal Service do not bear license plates. Nineteen states require only a rear tag. The requirement of a front and rear tag in the other 31 states, and Washington D.C., is a matter of great discord for many who find it aesthetically displeasing. For the issuing states, however, the revenue created by requiring a front plate that can be read to pay for tolls, parking garage fees, etc. outweighs any negative aspects.